Drop-Off Spots: If it's cold and rainy, or if you don't want to make your family walk, stop by one of these spots. Once you've dropped off your passengers, we'll help you get parked and in the building. If you’re a first-time guest and have questions, stop by the welcome area at the front of The Grove. Our leaders will be there to help answer your questions. We’ll get your child checked in and tell you everything you need to know. • Follow the directions on the screen. This will provide your child’s room location. • Take your name tags (both of them). • Place one tag on your child. • Keep one tag to present at pickup. Note: this is very important. 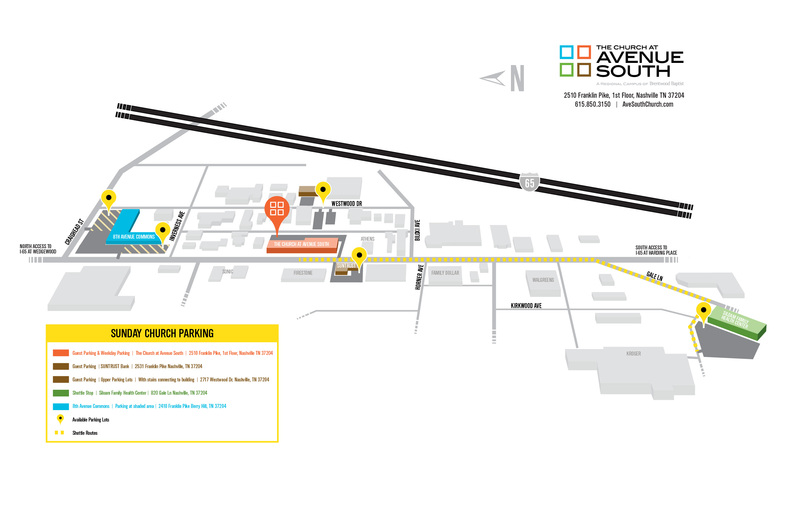 In addition to our drop-off locations, we also reserve parking for handicap accessibility. Let our parking lot team know your needs and we’ll get you where you need to go. Our Worship Center comprises a large part of our building capacity, and it has a seating capacity of 290 seats. The rest of the building is classrooms, as well as a gathering space for preschoolers and children. We value building relationships, and that happens in the church building on Sundays. But, often times meaningful relationships are nurtured outside the church building, during the week. When you enter our building you’ll find a casual atmosphere, friendly faces and warm coffee to get you going. We encourage you to come as you are, so there’s no need to dress up just because you’re entering a church building. We hope you’ll make yourself at home. Our worship service is led by a combination of leadership and a worship band. Our style includes hymns and newer songs based on Scripture—providing something for everyone to participate in worship and an easy way to connect to Jesus. Our pastor's approach is to teach the truth of the Bible for the purpose of transforming lives. By digging into Scripture and providing application, we encourage our people to be hearers and doers of the Word.